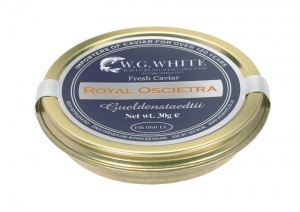 Oscietra is considered to be one of the most refined and popular caviars for taste. Characterised by a firm golden to dark brown egg it ha s a mellow nutty flavour and egg size of between 2.6 - 2.9mm. Originating only from fully mature 11 - 12 year old gueldenstaedtii. Our 30 gram jar is a perfect taster for a single serving and as an introduction to caviar tasting, All our orders are sent next day delivery in a chilled packaged in a presentation Gift Box to ensure it remains as fresh as possible. We offer free delivery on orders over £100, for orders below £100 there is an £8.50 delivery charge. Orders placed before 1pm will be despatched on next day delivery (Mon - Fri excluding public & bank holidays) using Royal Mail special delivery. Royal Mail will only deliver your order if somebody is available to sign for it so please ensure that someone is available at the delivery address to sign for the order. Once you have placed your order you may change or cancel your order before it is despatched by contacting our Customer Service Department on +44 (0)20 8991 4365. After your order is despatched you will be unable to make any changes to it but you may be able to return the goods as per the below. If you are buying these goods as a consumer you are entitled to return any unwanted goods (excluding temperature controlled goods such as caviar) within 14 days from the day on which you receive them. All goods returned as unwanted must be unopened and in their original packaging. Notice of such returns must be given in writing to our Customer Service Department, please see the Contact Us page for details. If you decide to cancel or return your items, we will reimburse you (by the method used to pay for the original transaction) within 14 days from the day the items are received back from you. Your statutory rights relating to faulty or misdescribed goods are not affected by this. In the event that you receive an item that is faulty please contact our Customer Service Department on +44 (0)20 8991 4635 who will arrange to ship you a replacement or refund you.